For a Srivaishnavaite – thinking of Him, praising Him all the time, going to temples of His, doing services to His bhakthas and associating oneself in any form with various kainkaryams to the Bhagwan Shri Maha Vishnu are the only real things. That Sri Vaishnavaites would relish doing such things naturally come to them. For Srivaishnavaites, visiting Divyadesams and having darshan of Emperumans in these places are of utmost importance. To us – “Kovil – Thirumalai – Perumal Kovil” reverberates sweetly and flows honey all the time. The word Kovil, Thirumalai, Perumal Kovil would refer to “Sri Rangam, Thirumala Tirupathi and Kanchipuram” respectively. 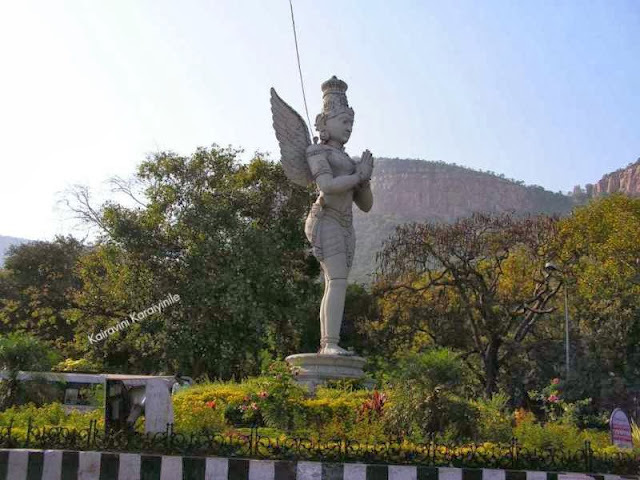 Thirumala Thirupathi Temple – the sacred and most reverred temple of Sri Venkateswara is located on the seventh peak – Venkatachala hill of Tirumala. The Lord stands tall as bestower of all boons and lakhs of people reach here to have a glimpse – a few seconds darshan of the Lord. This beautiful temple in its present form owes a lot to the works of the greatest Vaishnava Acharya – Sri Ramanujar. Not all would have noticed the newsitem of Andhra Pradesh CM N Kirankumar Reddy laying a foundation stone of …………. ‘International cricket stadium’ ….. coming up at the foot of holy Tirumala Hills ~ it has raised eyebrows on both ecological and security angles. Touted as a major facility for sports enthusiasts of Rayalaseema region, newspaper reports of The Hindu stated that a 30-acre site of Sri Venkateswara University has been identified for the stadium on which the Andhra Cricket Association will construct the stadium. The stadium is coming on a site where there are around 4 lakh fully-grown trees, including the precious and endemic red sanders. The region is a rich catchment area for water flowing down the hills and is adjacent to the zoo. Forest officials, on condition of anonymity, admit that it is home to several endangered and herbivorous animals, which frequently stray on to the Alipiri-Cherlopalle bypass road. Even leopards have strayed on to the road in the past, indicating the growing man-animal conflict. “It is ecologically disastrous to disturb the forest. Tirupati definitely needs an international stadium, but not at the cost of its rich biodiversity conservation. Instead, waste and barren lands available in the Renigunta belt can be used,” says K. Srinivasa Reddy, president of Intellectual Forum and himself a soil scientist. Alipiri already bustles with one lakh pilgrims everyday and this stadium adds 30,000 more people, causing strain on infrastructure. It may be recalled that the TTD declined alienation of its land to its employees here, indicating that it should be used to facilitate ‘natural expansion’ in future. “The establishment of a stadium in the little-known Gachibowli area in Hyderabad spurred development,” Dr. Reddy recalled. At a time when Tirumala already faces security threat, the cricket stadium allows people to move much closer to the base of the Tirumala hills, which is increasingly becoming porous with the construction of such structures at the base. Only recently there was news of an Islamic University being promoted at Tirupathi and now comes this stadium ……. Is there any sinister design to upset and create trouble in the holy city, one wonders. While this has caused deep sense of anguish and great concern, there is some solace in the news that taking suo motu cognisance of the news report published in The Hindu , the National Green Tribunal, Southern Bench, here on Thursday restrained the authorities from taking any further steps in establishing an international cricket stadium at the foot of Tirumala Hills. The Bench comprising judicial member Justice M. Chockalingam and expert member Prof. R. Nagendran said, “The Tribunal feels that the proposed plan is likely to affect the ecology and environment and also spoil the greenery of the region. The Tribunal directed the authorities including the Secretary, Union Ministry of Environment and Forests (MoEF) and Chief Secretary, Andhra Pradesh to appear in the next hearing with their explanations. Posting the matter for further hearing on December 10, the Tribunal also directed the Member Secretary of Andhra Pradesh Pollution Control Board to produce video shots of the area. It is not Cricket for sure.